Thank goodness for christmas specials! A source of blogging topics for me – sorry to bombard you with a lot of posts in one day. It is a new year’s resolution/goal of mine to blog more often this year. I found it hard the last few months because I stare at a laptop monday-friday each week at work so it when it comes to blogging in the evening or weekend I don’t fancy looking at my laptop and typing again! Hopefully I will blog more often if I have enough topics that compel me to write. Christmas specials are odd episodes for Doctor Who. It has become a somewhat tradition to have Christmas specials since the series was revived in 2005. The majority of specials are standalone episodes that do not link or reference the preceding or succeeding series heavily. I personally find the specials a bit hit or miss. They can be good episodes or they are really dire! This blog post will mostly focus on the 2014 episode Last Christmas. Before I cover the latest episode I will quickly run through what I think of previous specials. The first ‘New Who’ Christmas special is The Christmas Invasion in 2005. This episode acted as a link between doctors. Christopher Eccleston had just regenerated into David Tenant. It could have been an introductory episode for this new doctor but David Tenant spends most of the episode in bed, only recovering to act the hero at the end. Despite this, I think it is a good example of a special as it focuses on Rose as a companion but also has good monsters/aliens in the Sycorax and Christmas themed enemies in robotic Santas and spinning Christmas trees. The Runaway Bride does well as a standalone episode. At this point, the Doctor is between companions having lost Rose but before meeting Martha. It doesn’t try to link the series massively. It is comedic with Donna played well by Catherine Tate. Her appearance is well received and Catherine Tate becomes a future companion. It has a good monster in the Empress of the Racnoss and sets up the narrative enigma of Mr Saxon. Voyage of the Damned is set on a space version of the Titanic. Again the Tenth Doctor is between companions. This episode is a bit of a miss for me. Kylie is the guest star and it is as if the episode focuses on “look what a big star we have”. I found the narrative a bit boring and predictable. I am ashamed to say I don’t recall much of The Next Doctor. I remember being quite impressed by it at the time with David Morrisey claiming to be the Doctor and the earth versions of the TARDIS and the gadgets that he had. It sticks in my mind as being a good episode but it is not entirely memorable as I think the Cybermen stories just merge into one in my head. I am not sure whether to count The End of Time as a Christmas special although it was broadcast in two parts over a Christmas holiday period. It did not feel like a Christmas special as the others do. It is the end of David Tenant’s time as the Doctor and feels more like a series finale rather than a special. I liked A Christmas Carol. It was a good standalone episode and one of my favourite with Matt Smith in it. It was a nice reworking of the traditional tale in a science fiction/fantasy setting. It feels the most Christmassy out of all the specials probably because the basic story of the narrative is so familiar. With Michael Gambon as the protagonist, it is very classical and performed well. The Doctor, the Widow and the Wardrobe hoped to build on the success of A Christmas Carol – being influenced by a well known story. Again, Matt Smith’s Doctor is present without his companions Amy and Rory. However, for me, the formula does not quite work for this episode. The Snowmen is a good return to form for the Christmas specials. It properly introduces the new companion Clara albeit in Victorian times (not counting her appearance as Oswin in The Asylum of the Daleks). The scary snowmen and Richard E Grant as a cold, calculating villain behind the Great Intelligence are sufficiently scary as monsters/aliens. There is humour provided by the Paternoster Gang i.e. Vastra, Jenny & Strax and they are established as key characters for future Victorian era adventures. There is a good rapport between the Doctor and Clara. She subverts some of the conventions such as remarking that the Tardis is “smaller on the outside” which leads us to think that she will be a different kind of companion. Her death in the episode creates the enigma of “the impossible girl“. I remember myself and my siblings being utterly confused by her death but knowing that she was to be a companion. This is an example of clever writing! The biggest disaster in the history of christmas specials had to be The Time of the Doctor. I actually cannot write how awful it was here. I felt like I had wasted an hour of my life after watching it. It was so dire! Usually I can defend Steven Moffat to an extent but this episode failed me. There was no way I could defend that episode in an argument. The best bit was Capaldi at the end. With The Time of the Doctor in mind I wasn’t sure what to expect from the 2014 special. I had liked the majority of series 8 apart from Danny and the final episodes. Although Danny returned in this episode (in dream form), it was a good way of tying up loose ends from the preceding series especially as it was a winter series so close to Christmas – a completely standalone episode wouldn’t have worked. Capaldi is fantastic and Clara has really grown as a character thanks to impressive performances from Jenna Coleman. I’d also heard rumours that Clara might be leaving in this episode and I was thankful when she agreed to travelling with the Doctor again as her character and the relationship between the Doctor and her have so much potential. At first, I was a bit wary of the dream theme. Mostly because I knew I would get confused (this did happen). I liked the episode overall though it was a bit reminiscent of the episode where Toby Jones played the Dream Lord and we had to decide what was a dream and what was reality. I thought it was cleverly influenced by Inception – a dream within a dream within a dream. The influence reassured me a bit with my lack of understanding of the episode at times because I remember watching Inception in the cinema and thinking it looked amazing but I had no idea what was happening. Also, could the tangerine at the end be like the spinning top in Inception perhaps or have I confused myself?! The monsters were a bit bland as most of the slug like, wriggly creatures from the last few series have been but I liked the guest stars. These supporting actors made up for the lack of scary monsters. Nick Frost was a wonderful, cheeky Santa (a character most specials have stayed away from) who provided a lot of humour. Saying that, the Doctor had some brilliant one-liners! It was nice to see Dan Starkey, who is usually under lots of prosthetics as Strax and various other aliens, in a supporting role as one of the elves. Natalie Gumede gave a confident and assured performance as the leader of the North Pole mission. For me, the stand out guest star was Faye Marsay as Shona. She was mischievous and funny yet vulnerable and scared at the same time. 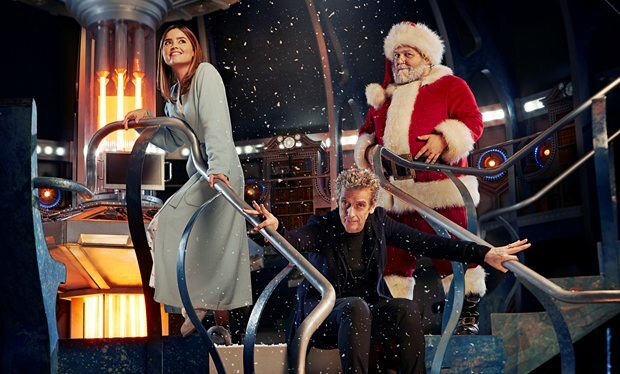 I actually thought at one point, in the sleigh ride “home” that they were setting her up to be a future companion. Who knows? She definitely owned the scene where she dances through the hospital to Slade’s Merry Christmas Everybody. Overall, a slightly confusing story because of the multilayered dream theme but it definitely made the audience think. It was a massive improvement on the 2013 Christmas special and I would definitely consider Last Christmas to be a good Christmas special. I agree with your assessments of each Christmas special, for the most part, though I think Christmas Invasion isn’t a very impressive debut for David Tennant. The way he dispatches the villain with a sword is both out of character for the Doctor and lame in its choreography. The Doctor, the Widow and the Wardrobe is probably the weakest for me, as it does not have enough story to justify the running time. Other than being pretty to look at, it has little going for it. I also agree that Time of the Doctor is a disappointment and a terrible send-off for Matt Smith. There is nothing “Christmas” about it other than the name of the village. It’s like they decided while shooting it to make it a Christmas special and shoehorned in a couple of weak holiday references. Thanks for your comment! It’s really interesting to hear another fan’s views. I agree that The Christmas Invasion isn’t a very good debut for David Tennant but overall I think it is a good episode. Similarly with The Doctor, The Widow and the Wardrobe, I agree that it is one of the weakest specials but The Time of the Doctor just beats it to be the weakest for me.